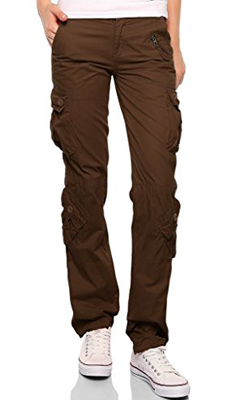 prAna Women Cargo Pants: a must-have for women who want comfort and practicality. 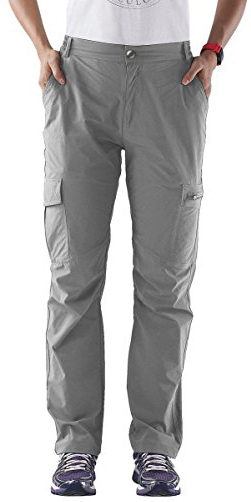 Nonwe Outdoor Water-resistant Cargo Pants: whether you are a camper or a hiker, these pants will become your favorite to wear out in the woods. Gooket Straight Leg Cargo Pants: a great choice for daily casual wear, comfortable and lightweight. 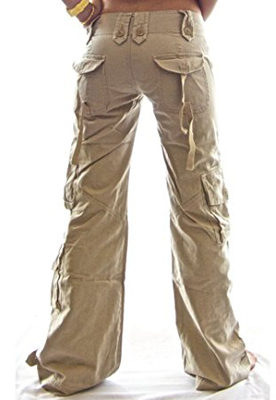 Jessie Kidden Quick Dry Cargo Pants: another design for those of you who take the outdoors seriously. Koi Medical Ultra Comfortable Cargo Style: designed for medical staff, they are scrub pants, suitable for students, residents, nurses, surgeons. Columbia Anytime Casual Cargo Pants: a great design for outdoor activities or for going to the gym. 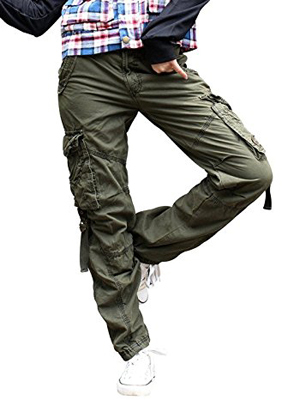 Designed by Juicy Trendz, these military cargo pants are great for both in and out of the field. They are quite stylish and if you have that 2000’s nostalgia, these are the pants for you. Worn with a T-shirt or tank top during summer and with a jacket overtop in spring and autumn, you cannot go wrong with this design. It has a low rise and comes with numerous pockets both in the front and back. There are two front pockets on the upper part and two in the back. At knee-level there are also two oversized pockets on both sides, with several other pockets on the sides and over them. 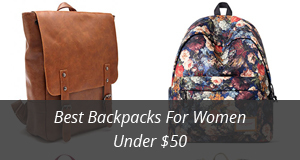 All of them together provide plenty of storage space for women working outdoors or avid travelers. Another way to wear these pants, apart from straight down, is by rolling them up. There are ties on the outer side of both ankles, which will help you keep the rolled legs of the pants in their place. You can find this design in 3 colors: Black, Green and Khaki. For those of you who prefer a more sophisticated look, prAna‘s Meme pants will fit right in with the rest of your clothes. 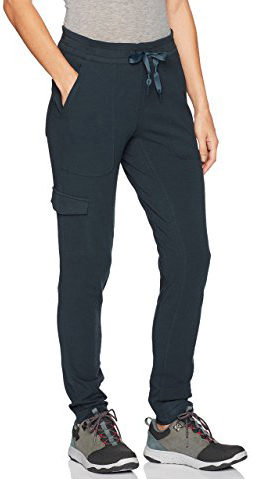 These chic pants are a must-have for women who want the comfort and practicality of cargo pants, but are not huge fans of the oversized style. They come in a skinny leg design and are mid rise. There are two side pockets at the hips and two in the back at the same level. Further down there are two side pockets with flaps and oversized, going slightly back. The stitching is interesting as it gives these pants a very casual and relaxed look that you are surely going to enjoy. This is a great cut for those of enjoy a more masculine style in their outfits as they look rather unisex and can be matched with any casual top you have. The color selection includes: Black, Cargo green, Quartz and Coal. This next design by Nonwe is perfect for outdoor lovers. 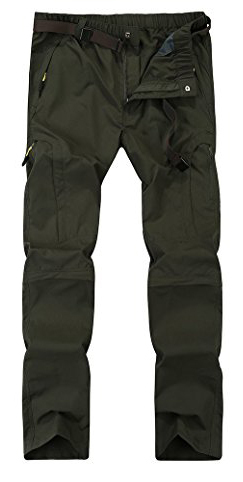 Whether you are a camper or a hiker, these pants will become your favorite to wear out in the woods. They are made of Nylon and Spandex, with plenty of elasticity that will allow you to move freely and comfortably. The waist is also partially elastic, along with having belt loops, so they can be adjusted to size for a perfect fit. The straight-cut leg design adds to the freedom of movement and being slightly oversized also factors in. This is a water-resistant design and very breathable, so if you will be doing a lot of walking or the weather is unstable, there is no reason to worry at all. It comes with two side pockets, two back pockets and two thigh pockets. Another great feature is the quick-drying fabric. There are 8 colors to choose from, including: Black, Light gray, Blue, Khaki and Green. Made of Cotton, Gooket’s cargo pants are a great choice for daily casual wear. They are comfortable and lightweight, but come with no stretch in the fabric. This, however, is not too much of an issue as the legs are slightly oversized to compensate for that. They are a boyfriend style design that goes very well with sneakers and T-shirts. On both sides there are hip pockets, two thigh pockets and also two back pockets. The waist and closure are an interesting combination. They close up with a zipper fly and button, while having and adjustable waist that you can fit to size using the draw cord it comes with. There are stitching details that make these pants quite appealing and add to the casual vibe of the design. You can get these pants in the color: Army green, Black and Khaki. 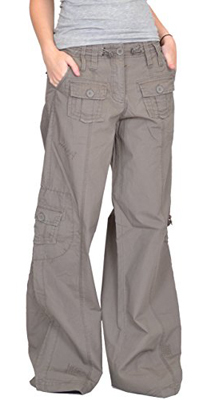 Another design for those of you who take the outdoors seriously, Jessie Kidden‘s Convertible Cargo pants are a practical and high-functioning choice for your next camping trip. Made of 100% Polyester and with a water-repellent fabric, you can wear these anywhere and in any weather. The fabric also comes with Omni-Shade technology that protects against the sun with a UPF of over 40. There are two zipper pockets on the sides, two on the thighs and one on the right side in the back. This is a great design if you will be moving around throughout the day and are especially suitable for outdoor activities such as hiking, hunting or fishing. The knees come with divisive stitching, which joins the thigh and the calf parts together for better movement. The waist is elastic and fits a belt as well. There are 4 colors to choose from: Army green, Khaki, Black and Grey. Lindsey is a design by Koi Medical, designed for medical staff of all statuses and ages. They are scrub pants, suitable for students, residents, nurses and surgeons. The fabric is a blend of Cotton and Polyester, are low-rise and come with an adjustable waist that you can wear to size. They are a loose fit and with straight cut legs, which provides the best movement and comfort. 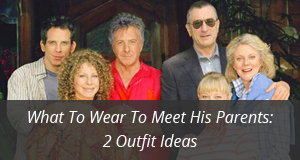 This is especially important since you will be wearing them for extended period of times. There are two side pockets, two back pockets and one thigh pocket suitable for scissors. On the left leg there is also a D-ring for your beeper, ID tag, nurse watch, etc.. The color selection is abundant, with over 30 options that you can select, such as: Blush, Turquoise, Papaya, Cornflower and Sweet coral. Anytime is a casual design by a popular US brand, Columbia. This brand focuses on designing outdoor clothing that withstand challenging conditions, so you know you’re in for a treat with these cargo pants. This is a great design for outdoor activities or if you will be going to the gym. They are adaptable to any activity you’ll be partaking in. They are made of cotton and Elastane, with Omni-shade protection against sun rays. There are two side pockets, two back pockets and two thigh pockets placed on the outer sides. They are a skinny design but in a loose fit, for maximum comfort and agility. Anytime are adjusted at the waist using a draw cord and are available in the color: Nocturnal, Shark and Night shadow. 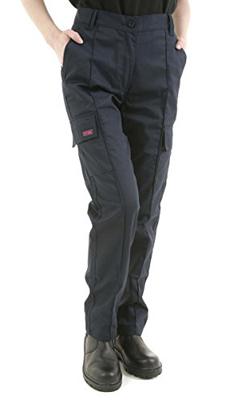 These cargo pants are by Site King, and these make perfect work pants. Whether you work in law enforcement, building or in any field that requires for you to move around a lot, then these pants will not simply do the job, they’ll make you look professional, too. They are a slim fit, made of 65% Polyester and 35% Cotton. Not only is the design comfortable, it is also quite practical as these pants come with six large pockets, providing plenty of storage space, a very essential feature when you need your arms and hands free. There are two side pockets and two rear pockets at the hips and two thigh pockets with Velcro flap. They close with both a button and a zipper and the waist has belt loops so they can be properly adjusted. This design comes in two colors: Navy and Black. 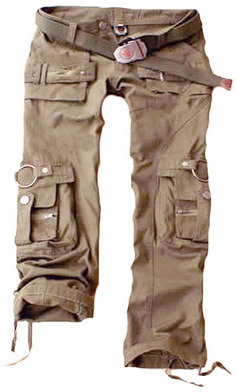 Urbanboutique brings us this military-style pants, in a loose fit and made of 100% Cotton. The fabric is lightweight, comfortable and easy to move around in. They are loose-fit and go very well as part of a casual outfit. There are side pockets, thigh pockets and rear pockets, all oversized, especially the thigh ones. There are also drawstrings at the ankles , so they can be adjusted to wear as preferred. On the waist, the closure is a zipper and button combination, with wide belt loops. They come in eleven color options: Black, Blue, Khaki, Olive, Camo-Black, Camo-Khaki, Green, Yellow, Camo-Pink, Red and Camo-Army. 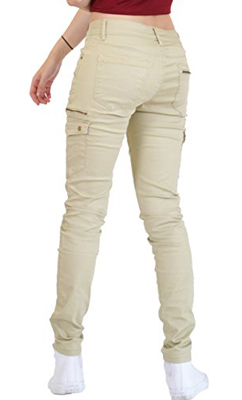 As casual as they come, yet quite chic, Match‘s cargo trousers are made of 100% quality Cotton. The fabric is breathable, but not elastic, which should be kept in mind. However, they are one the loose side, so the stretching is not an issue. There are two side pockets, the left one with a smaller zipper pocket below, two flap pockets on the thighs, two small pockets on the knees and of course, two rear pockets. They close with buttoned-down flaps, except for the side ones, which are slip pockets. The ankles are adjustable with drawstrings and the waist has wide belt loops. The color selection is abundant, with fifteen different colors: Brown, Red, Indigo, Light grey, Army green, Orange max, Apricot, Olive green, Blue, Green max and varying shades in between. Next, let’s take a look at these hippie-style pants, a design by Molecule and they’re called Himalayan hipster. The design is called hipster, because of the slim cut on the upper part and the low rise. They get wider as they descend, with the bottom being wide and loose and longer that in most pants. The belt loops are in a flap design, with buttons holding them down, which give an interesting look to these pants. There are two side pockets, one thigh pocket, two ankle pockets and two rear pockets. 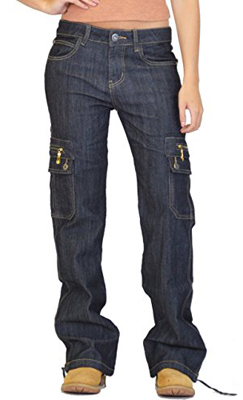 These are fashionable casual pants that will give a carefree and youthful look to your style. The color options include: Coal black, Euro woodland camo, Field green, Desert khaki, Dirt brown and Shadow grey. Continuing with another pair of wide pants, these ones are by Zelia and are loose all the way. 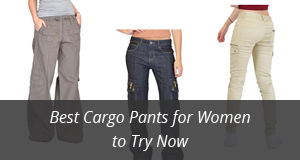 They make great everyday pants, as they are quite comfortable and very suitable for spring and summer. The material is 100% Cotton and they fasten up with a zip and button. An interesting feature are the drawstrings at the waist, that make these pants practical, especially for those who are not big fans of wearing a belt. However, there are belt loops as well, if you’d rather wear one. There are two side pockets, two small decorative pockets to the front, two knee pockets and two rear pockets. They come in three colors: Black, Brown and Khaki green. This next design that we’ve selected is by Ana Lucey, their Slim skinny stretch pants, that are designed for those who love wearing jeans, but would rather go with a lighter and a lot more comfortable option. They are a loose fit that tightens at the ankles, making them feminine and quite casual. The material is a blend of 98% Cotton and 2% Elastane, so there is room for some flexibility with this pair. On the hips there are two side and two rear pockets and further down there are two thigh pockets, with snap-button flaps. The rise is low, fitting them into the Hipster trousers category. They come in the color: Beige, Grey and Light brown. We mentioned jeans previously, so it’s only fair that we do include an actual pair of denim cargo pants. These are by Glamour Outfitters and are made of 70% Cotton, 28% Polyester and 2% Elastane. The closure is a zip and button combination, with short belt loops at the waist. 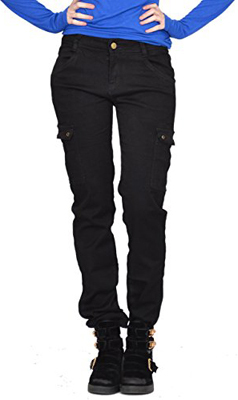 The upper pockets imitate the classic five-pocket style of jeans pants, while at the thighs there are four oversized pockets, two flap pockets and on top of them, two zipper pockets. These are a loose fit, with wider ankles, that are adjustable with drawstrings. There are two colors to choose from: Black and Blue. Ending with a versatile design that make great casual pants, but can be worn in the workplace as well, as they come in a minimalistic design, with high quality materials that make them comfortable, elastic and practical. Speaking of material, it is a combination of 75% Cotton, 23% Polyester and 2% Elastane. They have a low rise, with two side pockets and two thigh pockets which are normal size and as an added touch to the design, they come with fake rear pockets. This pair goes great with casual shirts and shoes and comes in the color Black.